The town’s first church and convent, built with wood, was started in 1771 by Fr. Domingo de San Joaquin and finished in 1776. By 1865, after renovations, it measured 57.4 m. in length and 16.5 m. in width. In 1952, the church underwent repairs of World War II damage. The church’s single level, Baroque facade, topped by a plain triangular pediment, has a semicircular arched main entrance flanked by massive square pilasters topped by urn-like finials, and semicircular arched windows. Above the entrance is a small niche with the statue of St. Isidore the Farmer flanked by semicircular arched windows. The square bell tower, on the church’s left, is probably a modern addition. Church of St. Isidore the Farmer: Lingayen-Labrador Road, Poblacion, Labrador 2402. Tel: (075) 549-5055. Feast of St. Isidore the Farmer: May 15. How to Get There: Labrador is located 359 kms. from Manila. Within the province, it is located 12.6 kms. from Lingayen, 10.5 kms. from Bugallon and 7.3 kms. from Sual. The Kampana (“Bell”) Museum, probably the only museum of its kind in the country, is housed within the compound of the Cathedral of the Epiphany of Our Lord. It displays an array of six old bells (some dating back to the 1800s) of different sizes (four of them still with their wooden yokes) of the parish on a raised concrete platform within a fenced in, shed-type enclosure. During the term of the first Team Ministry (when the “Three Kings” Parish was renamed “Epiphany of Our Lord Parish” in 1965) of the parish (composed of Fr. John R. Palinar, Fr. Jose S. Estrada, Fr. Manuel S. Bravo and Fr. Victor Z. Embuido), these church bells were replaced by new ones (sourced through donations from civic-spirited citizens here and abroad). These old church bells were, in turn, housed in a museum built during the term of the second Team Ministry (composed of Fr. Alberto T. Arenos, Fr. Camilo Natividad and Fr. Jovino Batecan). The museum was inaugurated on March 31, 2002. Inscriptions on the bells oftentimes indicates the bell’s date of casting, its weight, the name of the saint (San Juan Bautista, Sta. Teresita, Jesus, Maria y Jose, etc.) 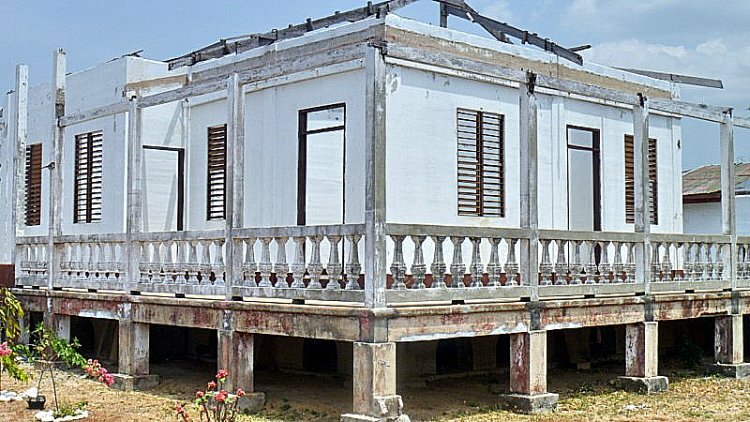 to which it was dedicated; the name of the town (Lingayen) for which it was commissioned; the name of the parish priest (Francisco Treserra, Isaias Edralin, Felix Sanches, etc. ), bishop (Cesar Ma. Guerrero, on February 22, 1929), pope (Pope Pius XI ); when it was cast; and even the name of the bell caster. I noticed one bell was cast in 1874, a second in 1883 and another in 1928. One bell is inscribed with “Fundicion de H. Sunico” possibly referring to metalsmith Hilario S. Sunico who cast 176 bells, dated 1872-98. His last known bell was dated 1937. Many of the bells are wrapped in a blue-green patina due to chemical reaction with air and sea water, over time, that causes copper, brass and bronze to form verdigris.The verdigris layer, which gives the bell its fragile beauty, actually protects the underlying metal from corrosion and degradation, which is why these bells are so durable. Cathedral of the Epiphany of Our Lord: Poblacion, Lingayen, 2401 Pangasinan. Tel: (075) 542-6235. 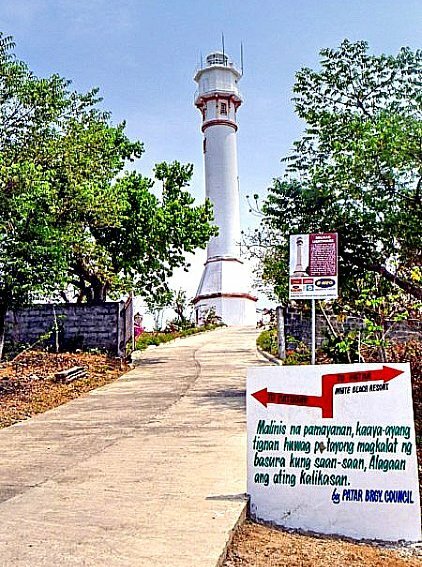 How to Get There: Lingayen is located 227 kms. (a 4.5-hour drive) from Manila and 94.9 kms. (a 3-hour drive) from Baguio City (Benguet). This church, once the largest church in the province during the latter part of the 19th century, was first constructed in the 16th century but burned down in 1745. The succeeding brick church, built towards the west of the former, was begun by Fr. Jose Salvador in 1747 finished by Fr. Francisco Barroso, OP, in 1754. During World War II, the church was heavily damaged (only the walls and the partly damaged bell tower were left after shelling by American warships from January 7-9, 1945) and later rebuilt. This church’s 3-level, relatively simple Baroque brick (now plastered over) façade has semicircular arched main entrance, flanked by semicircular arched windows, at the first level; and a semicircular arched statued niche, flanked by semicircular arched windows, at the second level. On display in front of the church is a huge 1880 bell that bears the logo Fundicion de Metales de Santos Supangco. The segmental pediment, separated from the second level by 3 rows of cornices, has a recessed octagonal window (above which is a cornice and a centrally located seal in the tympanum) flanked by smaller, recessed octagonal windows. The huge scrolls flowing down from the base of the pediment are typical of the Italian Baroque style. The 5-storey, square bell tower, on the church’s right, has blind semicircular arched recesses (canopied with triangular segments), at the the first 3 storeys, and semicircular arched open windows at the receding upper levels. It has 3 bells. One bell, weighing 4,130 pounds and cast in 1804, was once of the three biggest bells in the Philippines. The church measures 94 m. long and 16.8 m. wide. Juan Fuentes y Yepes, the Bishop of Nueva Segovia, is buried here. The 35 m. long transept has a high dome with 4 windows and is supported by 8 elegant columns with Composite capitals. The interior also houses 5 exquisite altars. Church of Our Lady of the Purification: Urdaneta Junction, Dagupan–Binmaley Road, Poblacion, Binmaley 2417. Tel: (075) 540-0047. Feast of Our Lady of Purification: February 2. How to Get There: Binmaley is located 223 kms. from Manila. After our lunch and ocular visit of Dasoland, we again boarded our van to finally make our way back to Manila. Its been a very busy and educational three days in Pangasinan. However, we haven’t traveled far when we espied the famous salt beds of Dasol. We therefore stopped along the highway to take pictures of these fascinating man-made creations. The province’s name was derived from the word panag-asinan (“place where salt is made”) and Dasol is one of only four Pangasinan towns (the others are Anda, Bani and Bolinao) that produce salt. 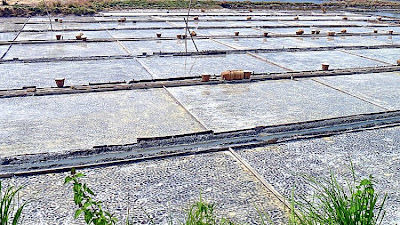 These salt beds, glistening whitely in the late afternoon sun, have sluices that are opened to allow about 3 inches of sea water from the incoming ocean tides of Dasol Bay to pour into and be trapped in a checkerboard of shallow ponds lined with grayish-brown clay and paved with shards of clay pots, similar to inland rice paddies. 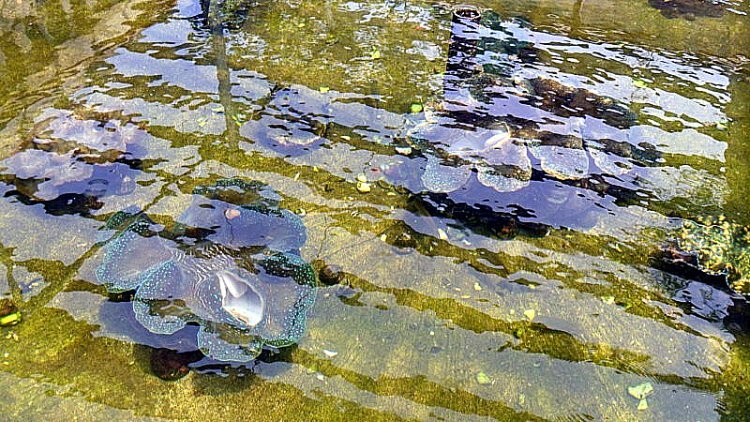 The impounded water is allowed to naturally evaporate in the sun for a few hours, after which thin crusts of salt crystals would form on the surface and sink to the bottom of the pond. The resulting encrusted salt is then raked, gathered into small neat piles, scooped into baskets and then transferred to a bigger pile in a hut. 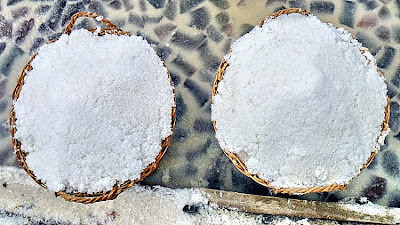 The raw salt is then brought to the cooking sheds to be washed, boiled and condensed into pure rock salt. 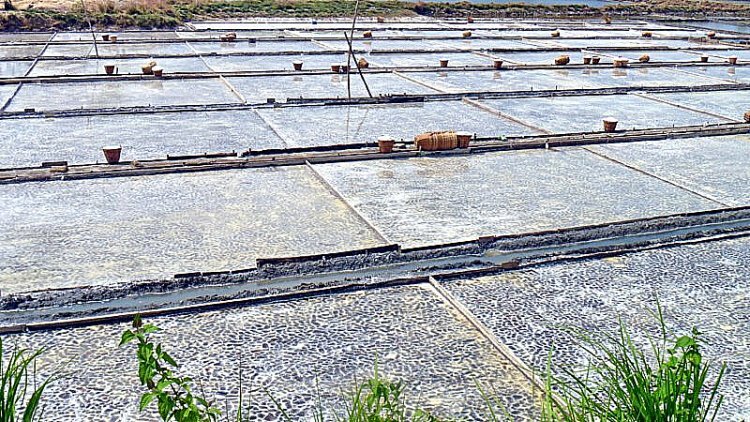 During the rainy season, the salt beds are converted into fish ponds. The Church of the Holy Child, already in existence in the 19th century, has withstood several natural and man-made calamities over the past decades. In 1832, a great flood submerged the convent and, in 1852, the church was struck by a lightning. It was repaired by Fr. Mariano Torrente (1858 to 1872) and, after a flood in 1881, by Fr. Epifanio Vergara (1893 to 1898). A strong earthquake on December 12, 1999, destroyed the 1830 church, collapsing the stone walls, facade, and the altar but leaving a few structural components and the foundation intact. In 2005, the church was restored and blessed and, in 2006, the old convent and the parish office were transferred to the other side of the church which used to be a chapel before the restoration of the church. The church’s Early Renaissance facade has tall, paired Doric columns on pedestals reaching up to the pediment and flanking the semicircular arch main entrance. Above it are semicircular arched windows while the pediment has a statued niche flanked by circular windows. The bell tower is a later addition. Church of the Holy Child: Sto. Niño St., Brgy. Poblacion, Mabini, Pangasinan. Feast of the Holy Child: Third Sunday of January. How to Get There: Mabini is located 322 kms. from Manila an 54.5 kms. (a 1-hour drive) from Lingayen via the Olongapo-Bugallon Rd..
On the way back to the Tourist Center from Enchanted Cave in Bolinao, we made a short stopover at a bridge to photograph the 7-km. 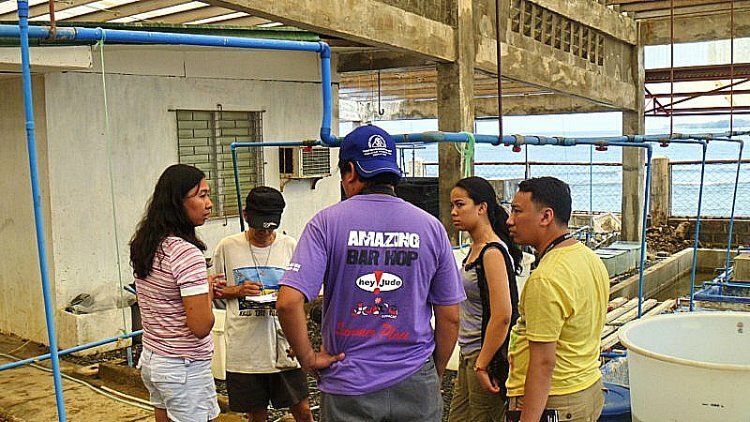 long, pristine and now fishpen-free Balingasay River (Brgy. 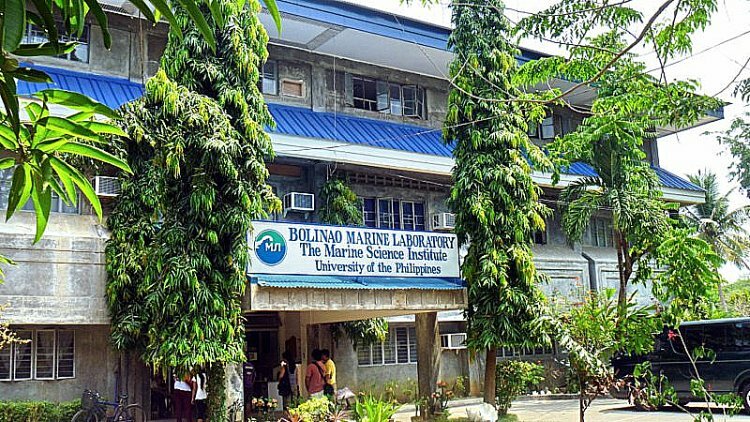 Balingasay), twice winner of the Gawad Pangulo sa Kapaligiran Award for inland bodies of water in the Ilocos Region and a recipient of the highly prestigious Wetlands Conservation Award in 1994. 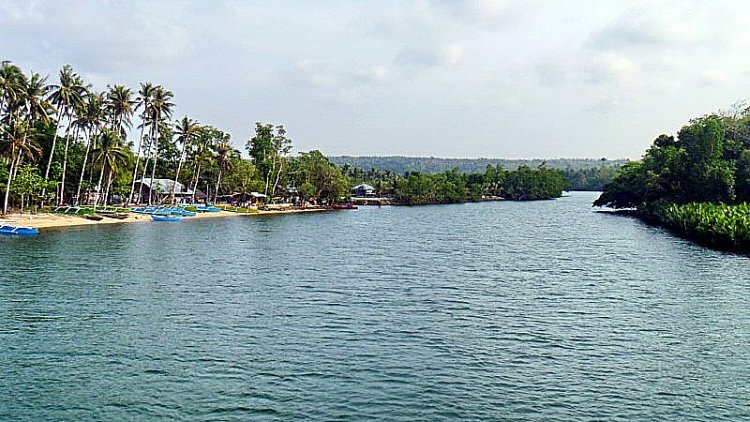 Set aside as a protected seascape, this river, noted for its scenic beauty and biodiversity, has 15 hectares of century-old and new growth mangroves areas, 30 hectares of of attap palms (used for nipa hut roofing), wild ferns and balete trees hanging into the water. These protect the river from erosion and pollution. Different species of wild birds (locally called kiaw and pagaw) also make their home atop the trees and wild ducks, lizards, monkeys and wild boar also make their home in the forest. The Balingasay River is fed by Quibuar Spring, Bolinao Falls and several other springs and creeks. Fresh water meets the sea water of the South China Sea toward the middle of the river, a perfect environment for unique fish (malaga, lapu-lapu, etc.) and shellfish (crabs, shrimps and oysters) species to flourish. Boats from the bridge can be rented (PhP500) to explore the river which connects 5 villages to the town proper, located 5.5 kms. from the mouth of the river. 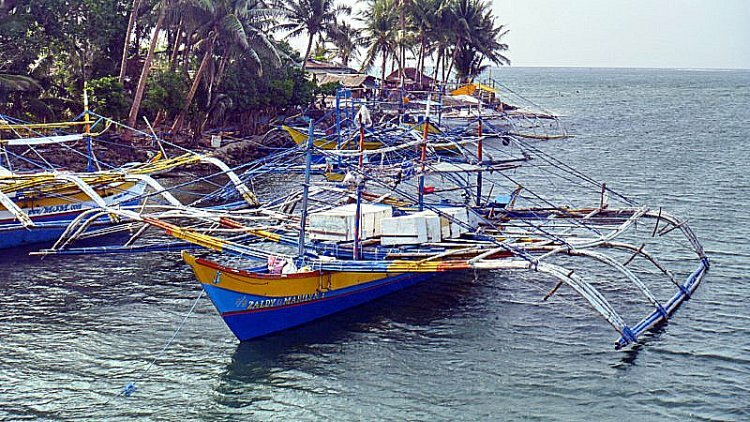 Aside from regular outrigger boats, some boats that ferry villagers are made, through Filipino ingenuity, from discarded wings of World War II airplanes secured from the former U.S. Naval Base in Subic. The wings are fitted with bamboo and wood as “balancers” and then wooden seats are installed for 12 people. After our Solomon’s Paradise sojourn, we next proceeded along the road to Enchanted Cave, one of three caves (the others are Cindy’s Cave and Wonderful Cave) in Brgy. Patar in Bolinao. Located in a private property it is, however, open to the public (in early 2000) but, you’ll have to pay an entrance fee of PhP30 if you’ll just look at the place and take pictures, and PhP40 if you’ll swim. This was to be my second visit to the cave (the first was in March 2005). The owner allowed us entry into the premises and, as we were in a rush, skipped the usual orientation by its staff. 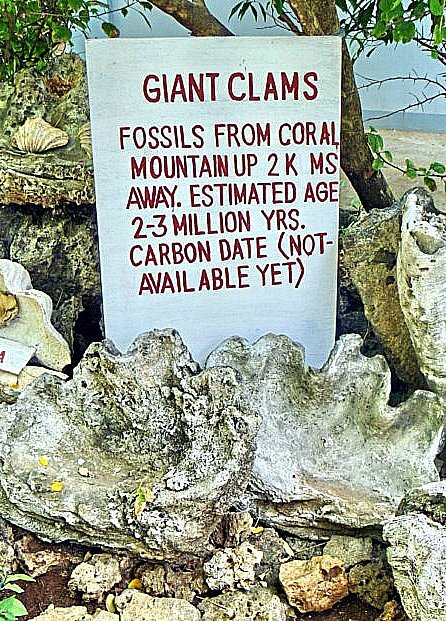 Along its paved walkway amidst a lush garden and huts, we noticed, mixed with the garden landscape, fossilized remains of giant clams discovered in the hilltop, 2 kms. 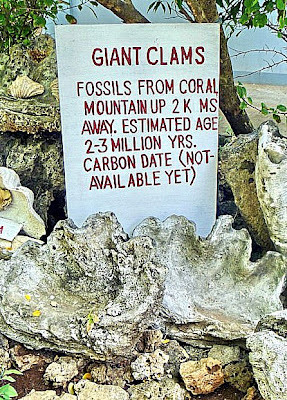 from the cave, and estimated to be about 2-3 million years old. 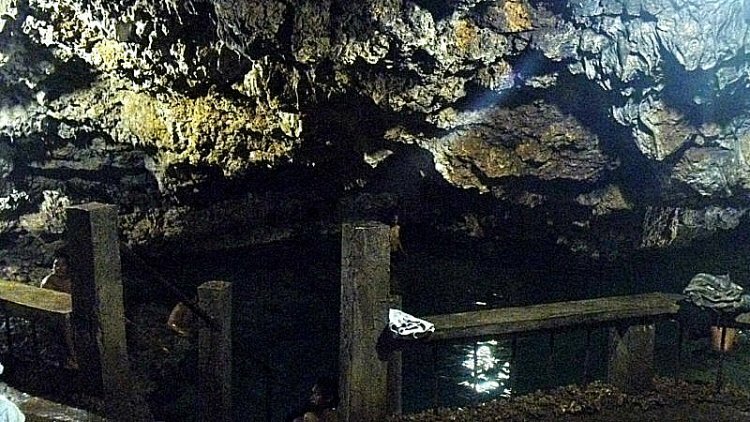 The fact that it was a cave made of coral limestone is evidence that the place was under water for millions of years and that the beach head of Bolinao extended almost a kilometer from the current beach line. We then carefully went down, through a small opening with paved steps and railing, to the cave’s 30-m. freshwater (which some say is unusual for a coral cave) pool with cool and crystal clear water. Adequately lit, it was very humid and musty inside. According to the caretaker, the pool, connected to an underground river, has depths of 3-6 ft., during low tide, and 3-10 ft. during high tide. Swimmers are restricted by management from entering certain areas clearly marked by ropes. Some scenes in the 1996 movie Ang Pinakamagandang Babae sa Balat ng Lupa (starring Ruffa Gutierrez) and the popular 2008 GMA 7 telenovela Dyesebel (starring Marian Rivera and Dingdong Dantes) were shot here. Actor Piolo Pascual was also said to have visited the cave. Enchanted Cave: Brgy. 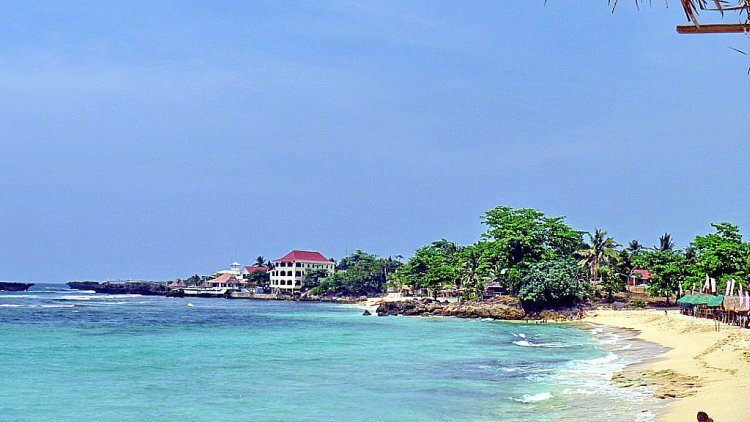 Patar, Bolinao, Pangasinan. After our Cape Bolinao Lighthouse tour, we proceeded to nearby Abrac Beach for an ocular visit. 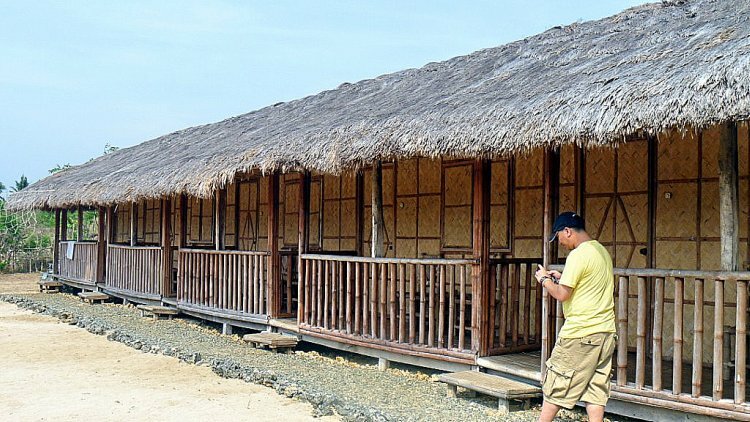 This white sand beach, open to the public, has no entrance fee but has native-style picnic huts for rent (PhP150-300) and a number of souvenir shops selling snacks, T-shirts (promoting Bolinao of course), shell handicrafts and other souvenirs. 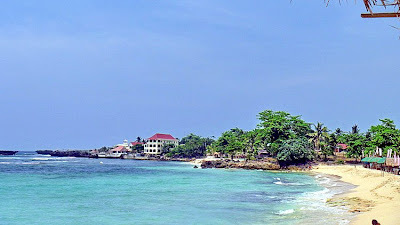 The Treasures of Bolinao Resort can be seen to the right of the beach. Going down to the beach from our picnic hut was via a steep berm. The resort has a main building with roof deck (where you can watch the sunset or dine al fresco) and a well-stocked bar. 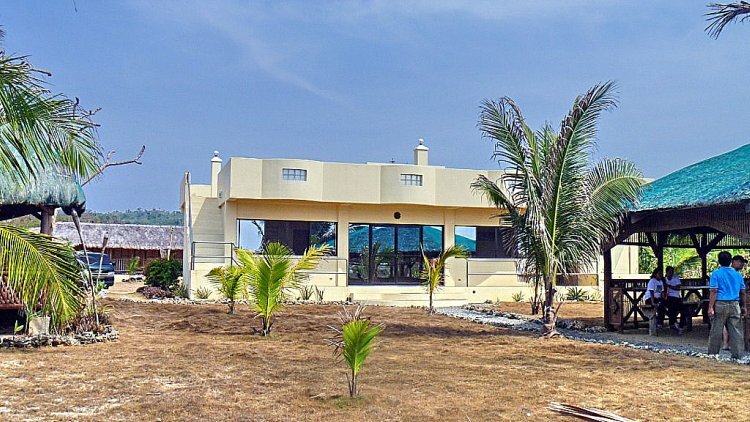 Behind it are accommodations for guests consisting of a native-style rowhouse with 3×4 m. fan-cooled rooms (PhP1,600-2,000 for 2 people and PhP2,500-2,900 for 4 people) with common verandah. In front is a beach volleyball playing area. Common toillets and baths for guests are located at the main building. The resort is a 3-min. drive from Cape Bolinao Lighthouse. Though we arrived at the resort during high surf, during calmer moments guests can swim at private coral-lined “bathtubs” and explore the sea caves. Maybe next time we could make that happen. Solomon’s Paradise Bar Grill Resort: Patar Beach, Abrac, Brgy. 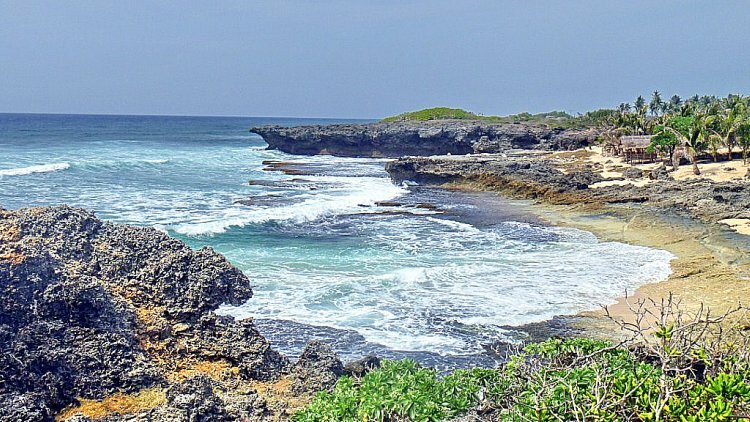 Patar, Bolinao, Pangasinan. Mobile numbers: (0905) 398-1470 (Globe) and (0928) 474-8845 (Smart). E-mail: solomonsparadise@yahoo.com. Website: www.solomonsparadise.multiply.com.